The latest version of the SOW Napoleon mod had been uploaded. It is version 1.27. Version 1.06 of the Sprite mod and 1.18 of the map mod are also available. 1. There is now a Player's Manual for the KS mod. It can found in a sub-folder labeled Manuals in the KS mod. It gives many specifics of the mod, why it is the way it is and tips for playing. 2. Cavalry patrols can now be split from a parent regiment and will go off and search for the enemy. When they are found, the scouts will send back a detailed report with their location, the location, direction of movement and composition of the enemy they see. This opens up a new facet of the game. See the manual for details of how to do this. 3. Most of the scenarios that come with the mod have been updated and should work properly. 4. 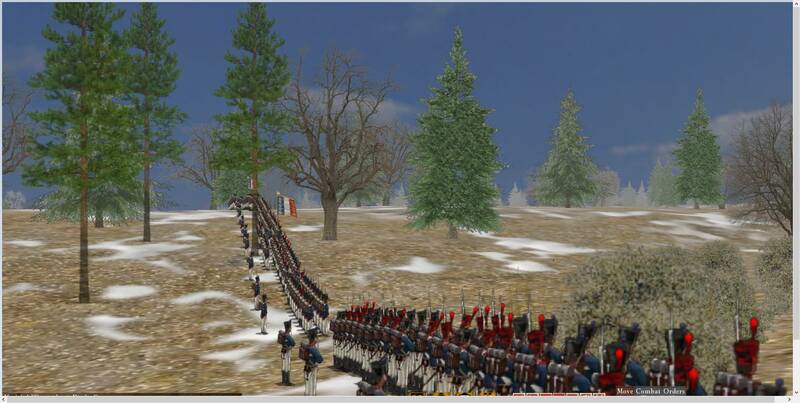 A number of new sprites have been added including Saxon cavalry, 1806 Prussian infantry, (very colorful now), some 1800 French cavalry and infantry, 1805 Russian grenadiers, Polish voltigeurs and winter fusiliers, more Austrian helmeted fusiliers and Russian hussars. Thanks to Jim Davey for his continued and constant work. 5. A few map corrections. Thanks for the fantastic KS Mods! I recently installed the new versions of the three mods. I mainly play SP and I am currently playing my first battle (France vs Russia) with the new mods. I used the new Cavalry Scouts option. Now I only have one game to go by, but in two instances in this battle a Russian Brigade has chased one of my Scout Cavalry across the map. One Brigade chased one Cavalry Scout unit right between two of my Infantry Divisions, the other cornered a Scout unit in the upper right corner of the map and just stayed there. The Russian Brigade that went between my two divisions ignored them and ignored the flanking fire from the Division Artillery. The brigade only turned to fight one of my brigades once I flanked it. Also, I do not know if the AI will take advantage of the Scouting option. If not, then I won't either, which would solve this. Just started messing around with this. Looks quite impressive. First welcome to the forum and thanks for the kind words. Did you TC or otherwise take direct control of the scouts? In their default mode, when enemy cavalry approaches the scouts, they should stop scouting and return to their parent regiment. They will move fairly quickly and should leave the enemy cavalry far behind. The enemy cavalry will lose interest and go back to what it was doing previously. No, the AI does not use scouts. It does not know what to do with the scouting information and no way to teach it. Thanks for the quick reply. I did not TC the scouts just pointed on the map where I wanted them to go. And sorry, I did not make myself clear, they were two Infantry Brigades not Cav Brigades that followed them. I won't use them in SP then if AI won't. BTW is there as specific Mod load order for the KS mods themselves? That is very unusual to have infantry follow the scouts. They will normally pay them no mind as they are not deemed a threat. Only cavalry take an interest in them and will drive them off. Were the scouts still in scout mode? Was only the green scout button visible on the orders tab or all four? If the scouts had been driven off by cavalry and were returning home, you may have inadvertently sent them back out to scout. In that situation, they would be viewed as regular cavalry, not scouts, and subject to prosecution. Don't worry about using them in SP. Using them reduces the number of meeting engagements that occur in sandbox games. It allows a bit of pre-planning before the fighting starts. No, they can be loaded in any order. The Scouts had been driven off and I did try to scout some more with them afterwards. So that would mean they became reg cavalry after being driven off. Ok that would explain a lot thanks! I still wish NS could change the AI reaction so it didn't send a whole brigade off like hounds chasing a fox though! It's not really the AI but the game engine that creates this situation. It has to do with the reaction range of the brigade. It's different for different stances. The more aggressive the stance, the larger the range. Unfortunately, there is no way to set the stance in the AI code. I know that sounds strange, but that's the way it is. I've just started playing with the latest version of the KS Mod and I've noticed that my infantry are standing in two-deep line again. I don't recall any of these mods being a problem before, but I may be mistaken, or it may just be the load order. What oob's are you using? Also, check the mods for any oobs. Grog wrote: What oob's are you using? 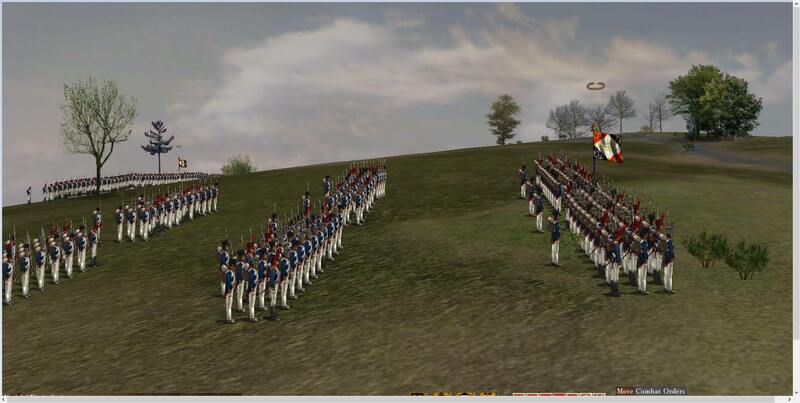 I am using the 'OOB _SB_NAP_Russia_1812' oob which came with the mod, and the recommended sprite ratio of 1:6. I'm sure the infantry are intended to be three deep normally with this mod. Changing the subject slightly I was playing around with the mods sound files yesterday to see if I could replace any of the marching music used. I have produced a .wav file of French marching songs and wanted to see if I could replace the Fr_March.wav in the sounds folder with it, so that my French troops would sing as they advanced into battle instead of just the current drum cadence. But it didn't work and they remained stubbornly silent. I fiddled around most of last night as I wondered whether there was a limit on the files playing time or something that was preventing it being read by the game engine. The vanilla Fr_March.wav is only 11 seconds long, but I noticed that some of the other march files like the Scot_March.wav are over a minute in length. My recording was over 4 minutes long, but i edited it just to include one song and reduced the time to 1 minute but it still failed to play. Oddly I also tried replacing the Br_March.wav with a recording of Lilliburero and that seemed to work perfectly. Either that or it was already included anyway and I'm fooling myself. but i thought the original was 'The British Grenadiers'. Anyway both these issues are cosmetic and don't really interfere with gameplay. I was just hoping to add a bit more immersion for my next video. I'm pretty sure that the 2 rank issue is due to your sprite ratio. I tried 1:6 and it produced French inf battalions in 2 ranks. At 1:4 I got the 3 ranks. I play my SP games at 1:4 as my system handles Corps v Corps battles ok. Cav regiments are quite big, though, at this setting. Re the sound files. I presume you are renaming the new .wav file as the same as the one in the mod? Otherwise not sure why it is not happy with it. There again, I don't understand sound files. Maybe check the properties for file size. Also, of interest, have you also looked at the sfx 'Excell' csv file in the Logistics folder(column C)? You can play around with what marching sounds are played by which units. This is linked to the Unitglobal .csv in Logistics. I, personally, don't like all the whistling and shouting so I change most of mine to drum sounds. I keep Pas de Charge and Scots bagpipes and a few others. They are three deep, check your screenshot again. Note also how the rank of NCOs is leaving space for the 3rd rank which isn't there? Compare this to a unit you know deploys in 2 ranks such as a British battalion. Weak battalions attempt to maintain frontage so they will deploy 2 deep, but in the centre of your battalion in the pic you can see the line is 3 deep. A higher sprite ratio will exacerbate this. Can you test with an Austrian OOB that has some of the big 1000 man battalions? As Grog says your sound file names must be the same as the existing ones, if you create a new file name you need to reference that new name in sfx.csv and unitglobal.csv, you'd then be unable to hear your own sounds in MP as unitglobal is sent to the peers by the host. Mr.Digby wrote: They are three deep, check your screenshot again. I did notice that small group of men clustered around the eagle, but assumed they were part of the supernumerary rank. But now you mention it they could just be the excess left over after the battalion has covered it's frontage. What I might do then is reduce the sprite ratio to 1:4 as Grog suggested and that should fill out the third rank a bit more. You were right it was the sprite ratio. Obviously at 1:6 the battalions were too small to have enough models to fill their allotted frontage 3-deep, so took models from the 3rd rank to fill the files. I had to go right back to 1:1 to get three full ranks, and even then the rear division has empty files in its third rank. But well spotted anyway. Grog wrote: Re the sound files. I presume you are renaming the new .wav file as the same as the one in the mod? Otherwise not sure why it is not happy with it. There again, I don't understand sound files. Maybe check the properties for file size. Yes! That's exactly what I was doing. I checked through the .wav files and made sure that Fr_March.wav was the drum cadence I was hearing in the game. Then I renamed that file xFr_March.wav just to preserve it in case I needed to put it back (which in fact I did), and then copied in the new file and changed it's name to Fr_March.wav. When it didn't work my first thought was that perhaps it was too long, so i checked all the others and the largest was just over a minute in length, although the French one is only 11 seconds. So, I edited my file so that it only included one song and was just over a minute in length and tried that but it still didn't work. I just got silence from the French battalions after I changed it. The Baden battalions still played a drum cadence and I assume they are getting that from a different file, but nothing from the French. I double checked the formats etc. but as far as I can tell a .wav file is a .wav file and I couldn't see any difference between them. Then just as a double check I replaced the Br_March.wav with a recording of "Lillibullero", and surprisingly that worked. So, I can change the British march but for some reason not the French. Just a bit puzzled now. I was even wondering whether singing just isn't audible in the game for some reason, but then there are voice commands shouted so that seems unlikely. Try a quick check of the sound files again, there may be more than one French march tune used and you altered one that wasn't being used by the units you were testing? However, I too, have come across silence when changing files. Wav files can have all kinds of variation like bitrate and other technical nuances in the original file before its encoded/compressed as a wav, so this could be the problem. I'm afraid I'm not a digital sound technician, but I am sure there are lots out there on general PC tech forums who would know. Blondo on the Steam Forum came up with the answer. It turns out the files I had produced were in Stereo format and the original versions were Mono. So, all i had to do was use Wavepad to convert them to mono versions and they worked perfectly. Also, I'm not sure I'd want this single song on a constant repeat loop, so the next step is to try and introduce some variation, and a pause between renditions. The other march I want to try and replace is the Russian one as that gets really annoying after a while. I remember from playing that MP game where I was trying to get some Russian grenadiers to do something useful that the constant repetition of the Preobrajensky march was unbearable by the end. So, I'm trying to find an alternative, but there don't seem to be many pre-soviet military marching songs available. These will have no effect if used with the KS mod. They require the use of the stock sprites. The KS mod does use a few, mainly a few cavalry types, but by and large they use custom sprites. Our MP games use a ratio of 1:5. This seems to work quite well. Do you like reggae? Austrian division commanders can play reggae when running. I am watching your Russian scenario. I'll add comments as I watch. Rather than pressing the Me button, press the 'F' button, (follow). Pressed once, you are glued to the saddle and can only look forward, no side to side vision. Press it a 2nd time, you can rotate your view but still be with the commander. Press it a 3rd time and it is turned off. The red rotate buttons on the toolbar only affect the selected unit. They do not affect subordinate units. The red use roads, run or halt buttons will affect subordinates though. The first regiment of cavalry you sent against the guns would have never charged them even if they had reached them. They were entirely disorganized. In general, you should try to attack a battery from the flank rather than frontally, (that's especially true for a Russian battery). The guns cannot rotate when unlimbered as they do in the stock game. I have turned off all my other mods for the time being. Partly to eliminate them as a cause of the two-deep issue, and partly because they don't seem necessary when using the KS Mod. Uncle Billy wrote: You were right it was the sprite ratio. Obviously at 1:6 the battalions were too small to have enough models to fill their allotted frontage 3-deep, so took models from the 3rd rank to fill the files. Well at least they coped with the deficiency of men correctly. I was under the impression from what I had been told elsewhere that the battalions shrunk their frontage when short of men. I reverted to 1:1 in the end to test the theory that it was the figure ratio. I tried 1:4 and the third rank was still nearly empty, but then I did notice that many of the French battalions in Davouts Corps are under-strength anyway. Uncle Billy wrote: I, personally, don't like all the whistling and shouting so I change most of mine to drum sounds. I keep Pas de Charge and Scots bagpipes and a few others. I imagine it will get annoying after a while, but it was an experiment. Uncle Billy wrote: I am watching your Russian scenario. I'll add comments as I watch. Nice! Not sure when I'll have time to record the second part, but I have a nasty suspicion that there are an awful lot more Russian's out there somewhere. I've used the same scenario for some of my testing and come across a huge cavalry force in at least one of those, as well as the massed artillery again. Uncle Billy wrote: Rather than pressing the Me button, press the 'F' button, (follow). Pressed once, you are glued to the saddle and can only look forward, no side to side vision. Press it a 2nd time, you can rotate your view but still be with the commander. Press it a 3rd time and it is turned off. Yes! Someone either here on on the steam forum has already mentioned the 'F' key and I've been experimenting with it and worked out the 'three tap' sequence. The first one results in me staring fixedly at my commanders back, but the 2nd tap lets me move the camera angle but keeps the camera tracking, and as you say a 3rd tap switches back to free roaming camera. I believe it will work on any selected unit, so you can follow charges etc. Uncle Billy wrote: The red rotate buttons on the toolbar only affect the selected unit. They do not affect subordinate units. The red use roads, run or halt buttons will affect subordinates though. Yeah! That took me a bit by surprise. Obviously as the Corps commander clicking on that in the video caused everyone to move towards the nearest road, or start running. Probably better in my case to avoid touching them. I doubt I will ever need to use the wheeling buttons anyway, as I try not to micro-manage at that level. Uncle Billy wrote: The first regiment of cavalry you sent against the guns would have never charged them even if they had reached them. They were entirely disorganized. In general, you should try to attack a battery from the flank rather than frontally, (that's especially true for a Russian battery). The guns cannot rotate when unlimbered as they do in the stock game. Yes! Darkrob and I were discussing this in the YouTube comments. The real puzzle is why they became blown so quickly. I used the same regiment to try and attack the two guns near the monastery earlier and they bottled then too, but they still had about 75% of their stamina remaining afterwards. Then they disappeared from camera for a while and when they came back they were completely blown. Darkrob wonders if they had been swimming back and forth across the Dnieper a few times, but whatever it was it must have been very tiring as the 3e still had a lot of stamina left even after their charge and pursuit of the Russian battery. Grand batteries are very difficult to deal with. If they are supported by cavalry or infantry, they are nearly impossible to neutralize. The only thing that can be done is to try and keep the troops out of its line of fire. Augereau's experience at Eylau speaks volumes.